Today’s WordPress Daily Prompt asks: How are you more likely to make an important decision — by reasoning through it, or by going with your gut? One of my boys was in the Scouts. 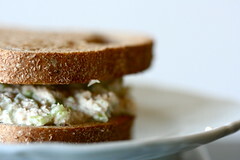 One Friday after school, we got him all packed up for a weekend camping trip somewhere and he asked me to make him a tuna fish sandwich for dinner on the road that night. I did that, packed it in a little lunch cooler and off we went to the designated church parking lot where his troop and the vans were waiting. We wrestled with all his equipment and got it all stashed into a van and off they went. It was a lovely warm Georgia evening and a very hot, sunny weekend was predicted. Instant panic mode! It had been in the mid-90’s all weekend. I picked him up and was relieved to see he wasn’t vomitting all over the church parking lot. Instead, he was just so darned excited that the sandwich was still there when he got back. Me, all I could think about was rushing to the hospital to treat his severe food poisoning. I took immediate action and I had great certainty in what I was doing. I grabbed my Super Blue Green Acidophilus and started emptying the capsules into water. He drank ten to a glass every half hour for two hours. Then we went to his soccer game and he was just fine. I knew that live acidophilus produces a very strong antibiotic called “acidophilin.” This is a natural antibiotic and just one of the benefits of eating acidophilus. I also knew that Super Blue Green acidophilus was of a quality I could count on—that it had real acidophilus and the acidophilus would be live. And each capsule also has some Super Blue Green algae in it. These little live good bacteria carried their own lunch box of wild edible microalgae packed full of minerals and protein so they tended to be strong and powerful bacteria. Always was a rebel!!! | My life! My Way! This entry was posted in Health, Lifestyle, Nutrition and tagged acidophilin, acidophilus, beneficial bacteria, food poisoning, Foodborne illness, Probiotic, super blue green algae by mycookinglifebypatty. Bookmark the permalink. Yes it was scary! But when a few hours passed and he was happily playing soccer I knew we’d be okay. What a great link! Let me know what you think! I bet those capsules and water were a lot more reasonably priced than the overall cost of the emergency room visit too. Smart thinking mom…great save of the day…thank you for sharing and for the ping back. Yes they absolutely were economical and all trauma avoided!